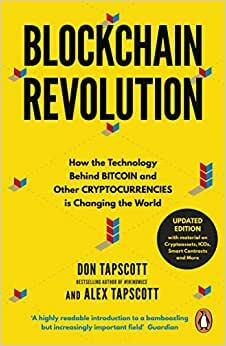 THE DEFINITIVE BOOK ON HOW THE TECHNOLOGY BEHIND BITCOIN AND CRYPTOCURRENCY IS CHANGING THE WORLD. Brilliantly researched and highly accessible, this is the essential text on the next major paradigm shift. Read it, or be left behind. Don Tapscott is one of the most influential living theorists about business and society. He is the author or co-author of 15 widely read books about new technologies and new media in business and society. Alex Tapscott is a Chartered Financial Analyst, working in New York and Toronto as Vice President of Institutional Equities, at the investment bank Canaccord Genuity. He is the author of Towards the Breaking Point: The Law and Political Emergency. A well written book, filled with examples and futuristic ideas we can all identify with. The book is quite useful and easy to understand. From page one I got hooked to the text and could deeply comprehend what is behind blockchain and its bright future. As a complete Blockchain novice, I found the Blockchain Revolution informative and easy to understand. If you'd like to understand Blockchain, this book is a good starting point. I found this book to be quite a slog, with lots of repetition. It could have conveyed the same information with half the words. I regret buying it.